Oh Boy. This finally happened. 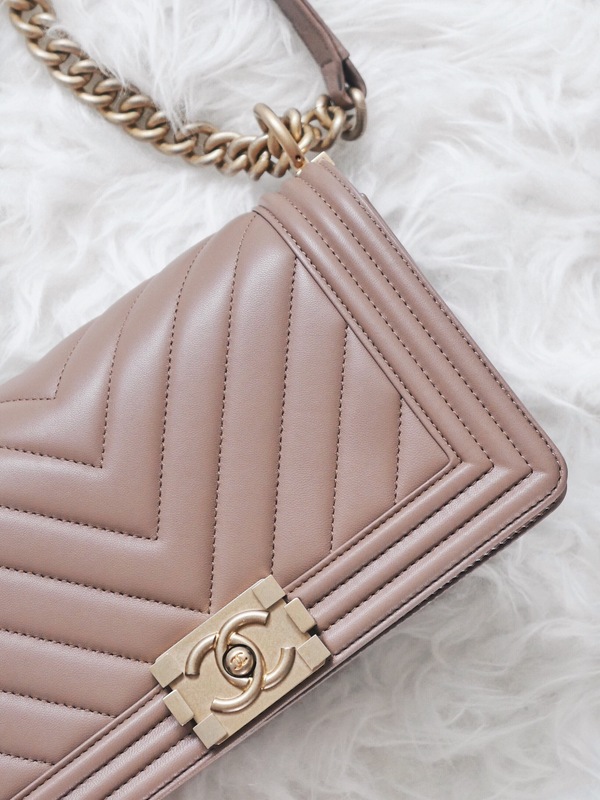 I’ve been on the hunt for a Chanel Boy bag for the longest time, as I have never came across the combination I liked. Every time Chanel released their new collection, I visited and re-visited the stores to check if my preferred combination (old medium / beige taupe / chevron / lambskin / ruthenium hardware) was available. No luck. I knew it was going to be a waiting game and that it would come when the time is right. Fast forward to now, I had come back to Rue Cambon in Paris, aka my lucky place (and danger zone), where I got my Classic Flap 5 months ago, to test my luck again. As soon as I stepped inside the store, I saw an array of new arrivals in variety of designs and colors, but I had one goal and one goal only: The Boy. Probably looking like someone on a mission, I headed straight to my SA (I will share her information if anyone is interested), and asked for the Boy, with my combination specifics. She showed me a Boy VERY close to my desired combination, but only in black with caviar. While it was indeed beautiful, since all of my other Chanel bags are in black, I wanted something different this time. When my SA opened the Boy Bag closet, one particular color caught my eye, and it was this beautiful, buttery beige color that I instantly fell in love with, and even though it didn’t meet all my combination checklist (the hardware was gold, not ruthenium) I knew it was the one. I may be biased but this is by far Chanel’s prettiest beige pink color I have ever seen. The official designer color name of this bag is ‘dark beige’, somewhat resembling of a caramel popcorn topped with pink sea salt (although I don’t know if such flavor exists, and what that would even taste like). I am a big fan of neutral beiges and pinks, and this is the perfect shade of beige pink. I also love that this color can appear differently under certain lighting: beige, pink, or even taupe. I have only had it for a few weeks now, but the color really grew on me, and still does every time I wear it. Since the brand Chanel itself screams ‘Chanel’ (not that that’s a bad thing), I wanted something more understated and muted. So with the gold hardware, I was initially concerned that it would make the bag look a bit fancier than I desired it to, however, I believe there must have been a reason why Chanel only made this in the gold, and I think the dark beige color of the bag and the gold hardware compliment each other very, very well. Funny thing is, had it came in the ruthenium hardware, I still would have chosen this gold hardware over it. Since my Classic Flap is in caviar with classic quilting and my backpack in calfskin also with classic quilting, I wanted something different this time. I also think the Boy Bag looks much better in the Chevron quilting, although that’s personal preference. I am aware that I have to be more careful with the lambskin, but I wanted something more feminine and soft, which I believe the lambskin exudes, whereas the caviar has an overall edgier look to it. There was no doubt the Old Medium was the perfect size for me. The small one was adorable, and as a lover of mini bags, I was slightly torn, but there just wasn’t enough space. It was also too long to wear it one chain on the shoulder or as crossbody, so there was only one way to wear it with doubled up chain, which is a total deal-breaker for me (I need to be able to wear my bags in more than just one way). New Medium, on the other hand, which is the next size up from Old Medium, was too big on my petite frame. The Old Medium is perfect and fits everything I need to and more. I will be showing you what fits in the next section. For the time being, I am so happy to finally have a Boy in my collection. Due to its versatility and functionality, I already know I am going to get a good use out of it, more so than the Classic Flap, which is suitable for more formal occasions. The only downside if I had to come up with one would be the price point, €3980. Previously €3720, Boy Bag (and some other bags) went through a price increase and we all know they’re only going upwards from now on. It is definitely one of the most expensive handbags in my collection, but with the VAT refund of €517.40, I know I have made a smart purchase by buying it in Paris. Another possible con of this bag would be the lack of compartments. With the Classic Flap, there is the main compartment with two mini pockets, one in the front, and also in the back. On the other hand, this Boy Bag only has one main compartment with a thin pocket inside. Regardless of the number of compartments, as I’ve shown you in the previous section, the Boy bag can fit much more than the Classic Flap, but I guess this could be an inconvenience for some. I have only had this bag for a few weeks now so I will have to keep an eye out on its wear and tear, but I have no doubt that it will age beautifully, as all the other Chanel bags do. 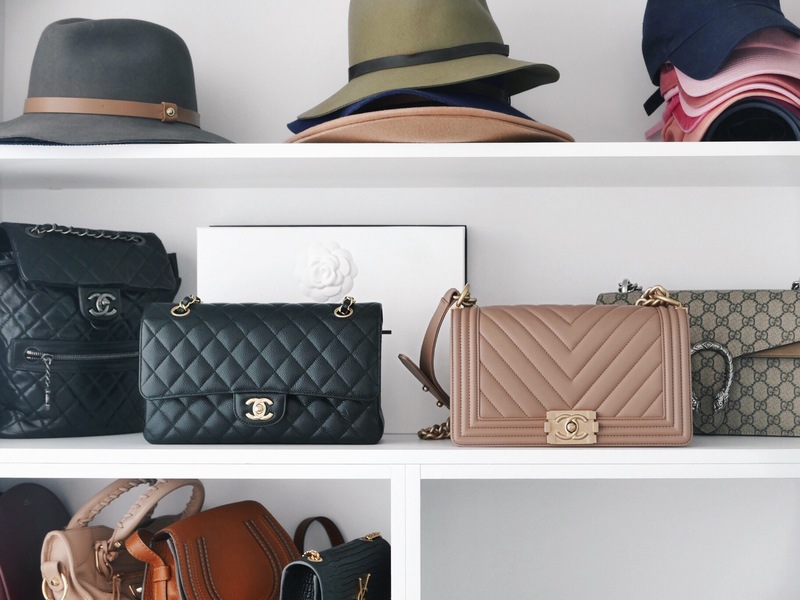 Quality is never questioned with Chanel. That is a great bag! Loved your experience at the Rue Cambon too! Would you mind sharing who assisted you there? Thank you! You can ask for Lena at the store. Hopefully you have a pleasant experience too! Where did you get your baseball caps? The pink ones are adorbs.